I chose this card to case. I LOVE all of Gail's cards and this was a great day to case a card of hers. I like her soft birdies better and the awesome flowers but hey, I don't have every stamp (believe it or not, heehee). I stamped with Desert Sand and colored with Copics trying to keep a soft look. I used Liquid Applique and Stickles on my berries and branches for snow. I love the shaped die cut card bases Gail makes so often and in this case I happened to have the same base die, yippee! 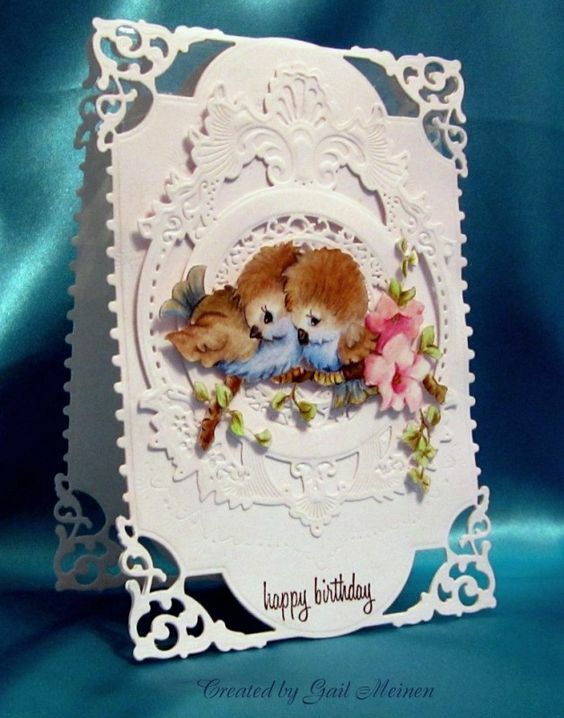 Your intricate die cut bg reminds me of wedding cakes of old when done with royal icing, Robin. I liked them....and I love your sweet card. The darling little bluebird and the snow-frosted berries are exceptionally done.....in true "Robin style"
Wow Robin, This is prettier than anything mother nature creates. Your bird and berries are colored beautifully. That bg die cut is amazing. Faved. I fell off my chair again! Gorgeous die cut layers, so intricate and beautiful! WOW! Fav'd and pinned! Wow Robin ... what a beauty. I love the die cut base and the bird is fabulous. Awesomeness here. Oh, my gosh, Robin!! Those die cuts are gorgeous and so very elegant! And the little bird is so beautiful on its snowy branch!! Great card! What lovely lacey die cuts framing your pretty little bird! How gorgeous!! Reminds me of vintage postcards and lace! You did an outstanding job with copics getting a beautiful soft look on your bird, Robin! I have not succeeded with that with copics! You did a magnificent job with those layers too! What a gorgeous card! Wow, the layers of die cuts here are so pretty, Robin! And that bird - I am nuts about bird stamps - but when you put berries with them - ooo, la, la!! Sweet little bird love how you colored him! He looks fluffy!! OMGosh Robin, this is gorgeous. I love your birdie - I seem to have a thing for them, they are so adorable.